This was an amazing chicken dish! It was simple and fast to make, but it tasted like you had to work on it for hours. It is definitely company worthy, and will probably make it on our list of favorite dishes. Butterfly the chicken breasts to create four halves. Season both sides of the chicken pieces with salt and pepper. Place the flour in a shallow bowl, and dredge the chicken pieces in the flour, shaking off the excess. In a large skillet, heat the olive oil over medium-high heat. Add the chicken pieces to the pan and saute until lightly golden, about 2 minutes; flip and cook on the other side, about 2 minutes. Add the garlic and thyme leaves to the pan and saute just until fragrant, about 1 minute. Off the heat, add the wine to the pan. Return the pan to the heat and bring the liquid to a simmer. Reduce until the sauce has thickened and the chicken has become golden brown on each both sides. Add the lemon juice to the pan and stir in the butter until completely melted. Serve immediately, and spoon the extra sauce over the chicken. 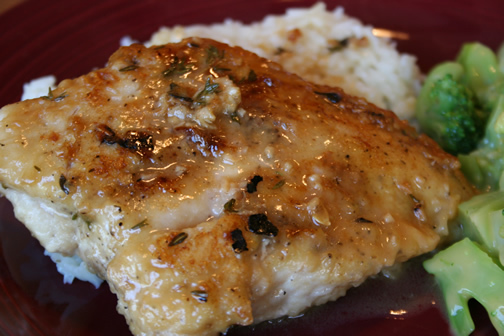 I will definitely have to try that Lemon Thyme chicken! It sounds really yummy! We have had unseasonably nice weather here in Mississippi. It's a nice reprieve from our usual heat and humidity! All your recipes sound really good! I've tweaked the Voodoo Pasta a bit for our taste and am going to use it next week for our pasta night! I'll give you a "shout out" for the recipe on my blog!! Mmm, that chicken does sound good, and looks good, too! I'll need more than 2 measly breasts to feed my guys, though. I used to make my own cheese sauce, but now I buy the Green Giant frozen kind. It's just faster. :) I used to just take a couple of tablespoons of butter, melt them in a pan, and mix with a couple tablespoons of flour. Then I would whisk in a cup of milk, and add in a cup of shredded cheddar. It tastes good, but the frozen stuff is just easier on busy nights.